« Do Scientists Seek Truth? Or Grant Money? Or Worse? I could not be happier. Greg and Jan Judy have an AWESOME internship program. You never really know what something is going to be like until you get into it, and I can say that having just completed my third week, I am very pleased. In my opinion, there is a near perfect combination of physical labor exercising all the major muscle groups and giving a good cardio workout, intellectual stimulation from conversations with Greg and with the other intern and observation of the wonders of God’s Creation. Greg is probably as close to a perfect boss as anyone could want. He doesn’t sit on the fence cracking the whip while we work or run all over the country speaking while we do all the work. No, no. Greg works right beside us all day long, often working harder than we do, leading the way, showing us how it’s done and taking on a lot of the undesirable, monotonous jobs himself. He also is very sensitive to our desires WRT scheduling. He does ask for a full 50 hour work week, which is quite fair considering what we are gaining by being there, but he is flexible on hours – giving us 2 hour lunch breaks most days (3 if it’s scorching hot), letting us off for required business or family needs, and trying his best to mix our day up with a good combination of monotonous work and mentally stimulating work. Greg recognizes that human beings are not machines. They do much better with variety and he tries to supply that within his internship and does a very good job of it. One day we got to knock off early and head to a Farm Walk at the farm of one of the leading graziers in the state of Missouri and we got to hear Gearld Fry speak. 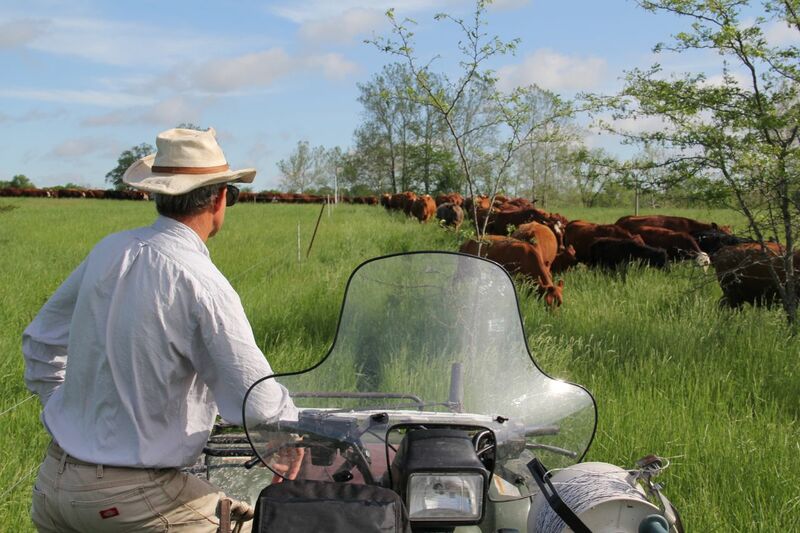 Gearld is legendary in the Mob Grazing world for his work with producing superior bulls for grass operations. Greg also takes us to lunch periodically at area cafes which are excellent. Boy I tell ya, a big old chicken fried steak with taters and sweet tea sure tastes good after a long morning of hard work. Greg is very big on attention to detail and orderliness but he is patient with us when we mess something up or break something. Greg is very big on making do with humble things which is an excellent character lesson to be teaching. If Greg has an old gate that will work, he would rather paint it and use it rather than buy a new one. Greg also works very hard to get graduating interns good jobs and he has been very successful. All of the most recent interns who wanted full times jobs in Mob Grazing have gotten them, most of them very well paying with good benefits. The jobs in Mob Grazing compare very favorably to jobs that college graduates are getting, BUT the cost of the education is far lower. Greg actually pays interns $200 per month plus provides free room and board. So when you graduate from Greg’s program, you have no student loans AND you only spent 1 year of your life preparing. Wow! What a deal! We don’t have as much interaction with Jan but she is a wonderful person as well and supports Greg wholeheartedly. She has been there all the way with him as he built his business. She also works hard to keep us hungry interns supplied with meat, milk and eggs – grass fed of course. Greg and Jan are from the “Weston Price” school of food so we are definitely on the same page there. So thanks, Greg and Jan, for all you are doing to teach people like me the wonderful art of Mob Grazing! This is truly the opportunity of a lifetime for me and I highly recommend this internship to anyone! This entry was posted on Saturday, May 25th, 2013 at 11:05 pm and is filed under Healthy Food & Agriculture. You can follow any responses to this entry through the RSS 2.0 feed. You can leave a response, or trackback from your own site.